Although they play a fundamental role in nearly all branches of mathematics, inequalities are usually obtained by ad hoc methods rather than as consequences of some underlying "theory of inequalities." 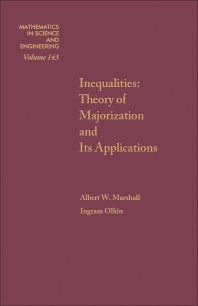 For certain kinds of inequalities, the notion of majorization leads to such a theory that is sometimes extremely useful and powerful for deriving inequalities. Moreover, the derivation of an inequality by methods of majorization is often very helpful both for providing a deeper understanding and for suggesting natural generalizations. Anyone wishing to employ majorization as a tool in applications can make use of the theorems; for the most part, their statements are easily understood.